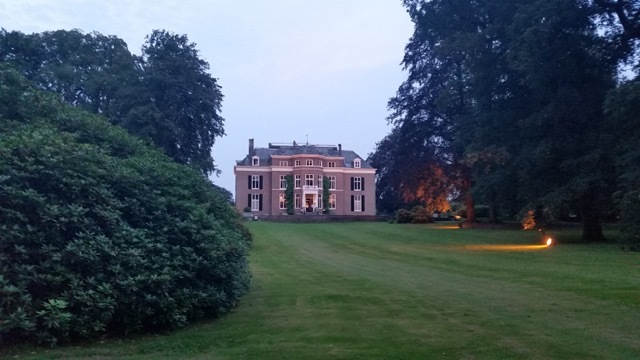 When we woke up on Sunday morning we all were looking forward to the concert at the Concertgebouw, but we were also a bit sad to leave Rhederoord and to begin our last day of this fantastic week. When we finished breakfast, there was already a big bus waiting for us in front of the building. 1.5 hours later we arrived in Amsterdam. 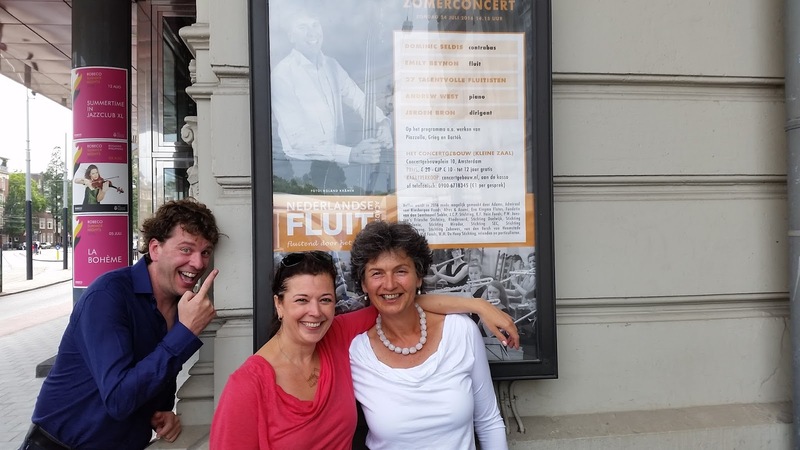 We took our flutes and music, took a glance at the big main hall and went upstairs to the Recital Hall dressing rooms where it was very cosy- we shared the rooms backstage with 30 people, but the room is usually only for four people in chamber groups! Before we started the general rehearsal, we watched the movie which Suzanne had made to show the public what we had been doing during our past week. Besides playing and rehearsing the final details we also rehearsed our stage manners- walking on and off stage. Fitting on stage and being in the right position turned out to be very difficult! If you came to our concert, did you notice that we walked on stage in less than 15 seconds?! This was Emily’s strict rule! We had our lunch in the artist foyer downstairs, greeted friends and family. 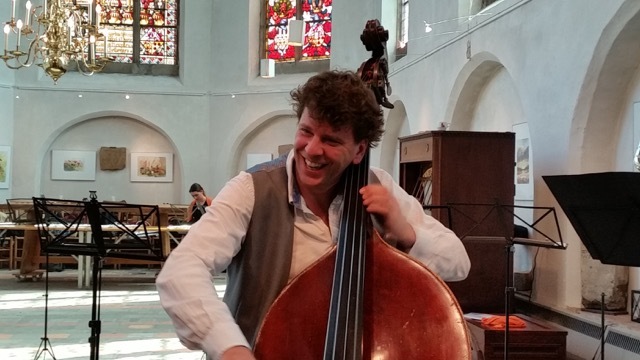 At 14.15 we started the concert, as is traditional, with Jeroen’s arrangement of the Holberg Suite. We enjoyed a wonderful concert and we were all so happy to share the stage with the amazing Dominic Seldis! Emily and Dominic both played fantastic solos and it was inspiring to play with such amazing musicians. The newly commissioned bass flute and the new composition ‘The Rooster and the Chicken’ went down really well with the audience. We all loved performing in such an amazing venue with all our new friends that we have made this week and it was a great way to end the course. Backstage again, we thanked Emily, Suzanne, Jeroen, Wieke, Andrew and Jeanette and gave them a game with a picture of every one of us so they won't forget this fantastic summer academy, just like us. Now it was time for a drink and saying goodbye... We laughed, hugged, took plenty of photos and then all went home. We all hope to be able to come back next year because we had such a great time! 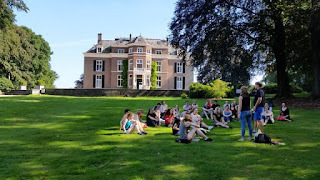 All of the buddy groups are obliged to write a blog entry to include you in a day of our summer course in Rhederoord, and ours is luckily after our first day of performances and so we have a lot to say! The day started with a rehearsal in a nearby church where we perfected our stage management and performance choreography. The rehearsal was long so we were so pleased it had warmed up so we coukd enjoy our picnic lunch outside with Dominic. 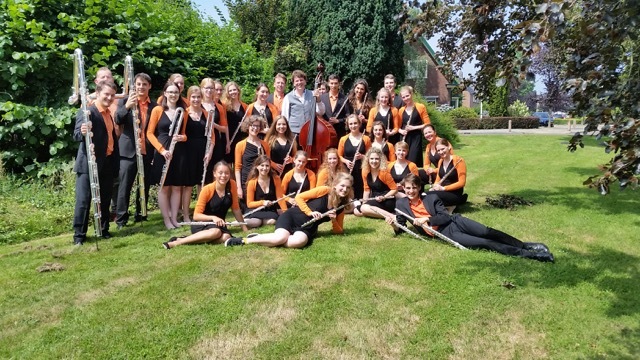 Some of the NEFLACers were lucky enough to get a ride to our concert in Park Sonsbeek in a convertable and they looked very glamourous. We were dissapointed when we discovered that some members of the huge crowds in the park were there to catch Pokemon, however our supporters were not deterred by their stupidity. 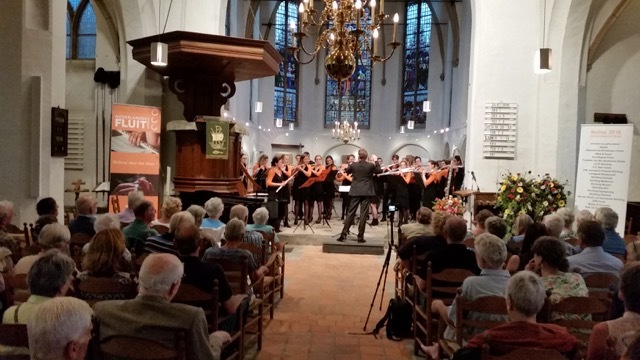 The concert, which which showcased some of the smaller chamber ensembles within the group was a great success! After that we had a fantastic dinner, AND DESSERT, and then it was time for another concert. This was a concert filled with highlights. 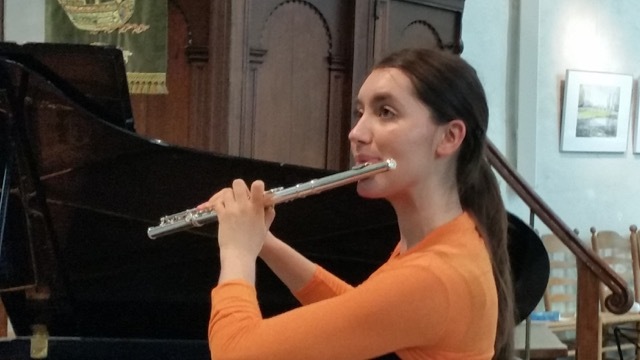 Our favourite piece was Czardas where we heard some of the most exquisite flute, piccolo and doubke bass playing known to man kind, performed, of course, by our hero Emily and the charming and inspiring Dominic. 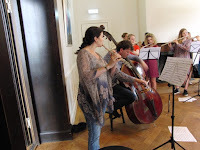 We also loved the performances of our three soloists Alenka, Daniël and Luke. Bravo. Your playing was so touching. 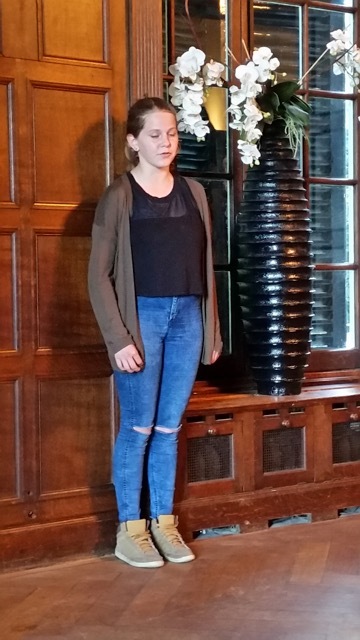 Nina had tears in her eyes during In Ireland, the flute and piano piece with Irish folk themes played by Luke and Andrew. 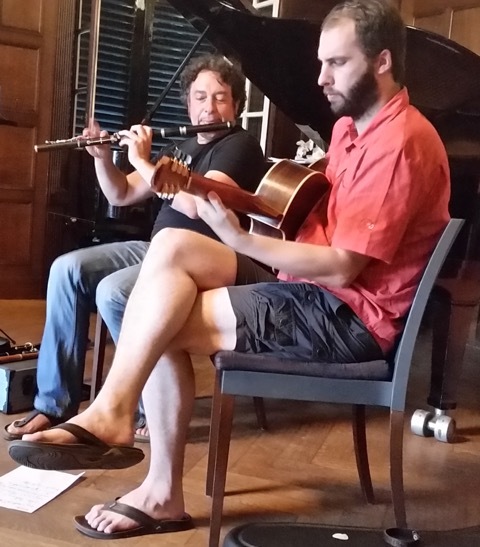 Another highlight was the world premiere of a new work called Rooster and Chicken for contrabass flute and flute orchestra where Matteo and Pedro showed us their full capabilities. We had an amazing day, no, a WONDERFUL AMAZING week! Tomorrow, around 6PM, the infamous after-Neflac dip will kick in. Till then, we will just enjoy our very last day in the Concertgebouw! 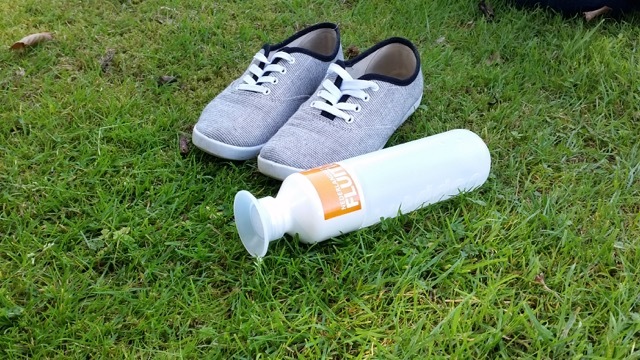 Neflac Summer Academy 2016 ran incredibly fast! The day started with a chi-gng workshop by Ronald. The workshop was very relaxing and inspiring. 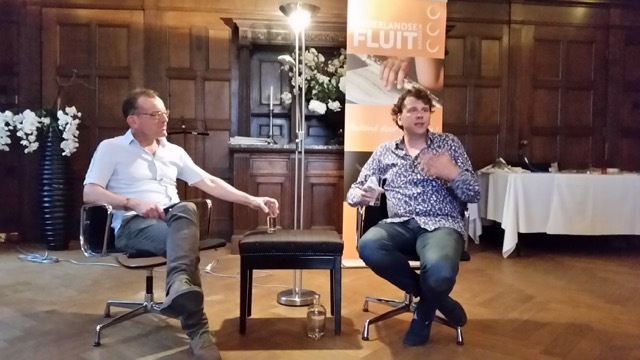 After that the NTK did a warm-up with Wieke and the YIP with Jeroen. Then some people got a wonderful Alexander technique lesson and the other people had their last individual lesson of the week or got some early morning practise. After that, we've got a very good lunch in the cellar because the weather wasn't very good. 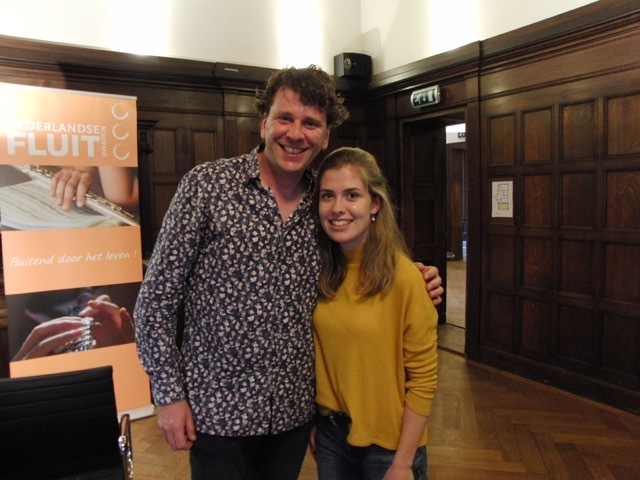 After lunch NTK had the last masterclasses with Emily, and after it she gave a spectacular lesson on orchestral excerpts to YIPs. 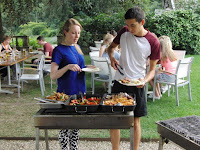 Dinner time and Dominic Seldis arrived, he is our amazing guest soloist for the upcoming concerts of the weekend. We had our first rehearsal with him and Emily as soloist...don't miss the concerts, they'll be amazing! The day ended with a funny Q&A led by Andrew. It was very interesting to hear Dominic answers to our questions and we are looking forward for this weekend of music together with him! Busy day in Rhederoord today. The F-jes (little cutie fluties) came to join us and had lots of fun doing the helicopter wave in our warm-up routine. It is quite difficult if you are not used to it ;) After that they profited from some lessons with Jeroen and Wieke and played a little concert for the NTKs. 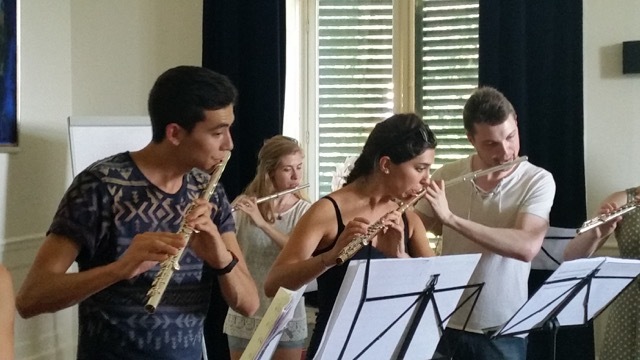 FUTURE OF THE FLUTE WORLD, WATCH OUT, THEY ARE COMING! 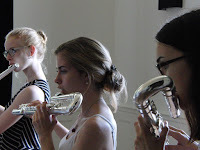 In the meantime the YIPs tried to put themselves together by playing some very fast and tricky scales, courtesy of Wieke Karsten; a good warm up for the lessons with Emily and Andrew that were to come! 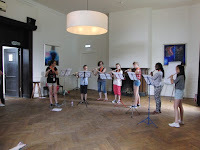 The afternoon started with Jeroen and the YIPpers working on their Bartok ensemble piece while the NTKs were having their Masterclass with Emily. Linda, Rivka and Nina played wonderfully. TIME TO SWAP!! NTKs moved to ensemble work and the YIPpers to Emily (<3). 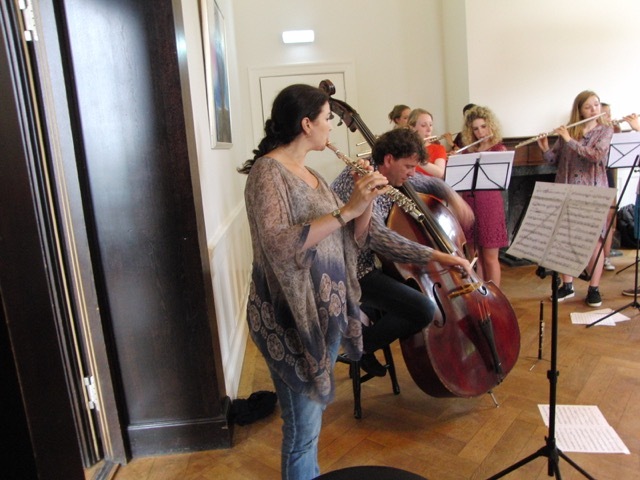 Mozart was the main theme in this masterclass (Stella playing his G Major Concerto and Carina the Rondo) with a virtuosic Nielsen Concerto intermezzo played by Nicole. Thus far, we had all managed to survive, so were able to attend (we swear!) 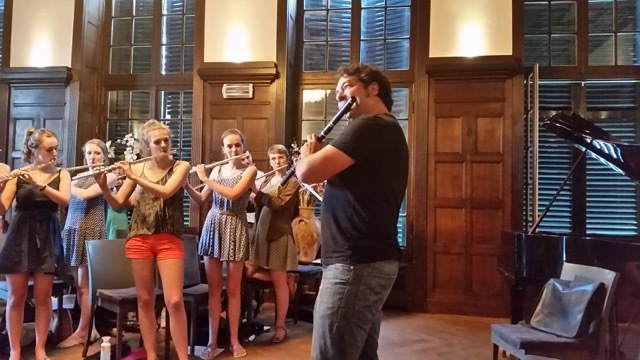 the flute orchestra on time..... oh, we love playing those pipes.... have you ever seen a contrabass flute? Seriously? 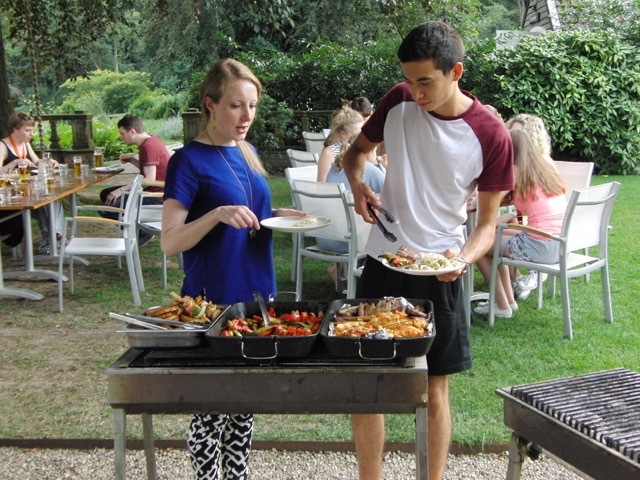 THE SMELL OF A NICE BARBECUE CAME TO US just in time to save Jeroen from our cannibalistic hunger. LEKKER! We finished our day with an adventurous walk into the woods of the Netherlands risking our lives and limbs from deers. Time for bed - though those eligible definitely deserve a drink first... GOOD NIGHT! The day started with a walk to the most beautiful place in the park with a circle of old trees. Over there we did a warming-up with YIP and NTK. 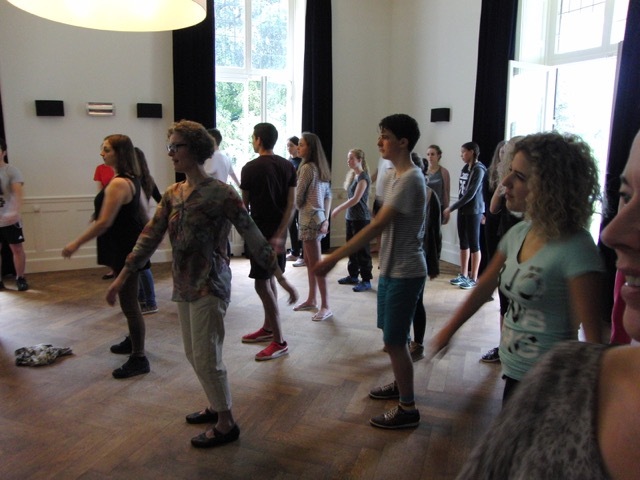 The YIP group learned a dutch song (almost learned.......) : "hoofd, schouders, knie en teen". After this nice beginning the two groups seperated. 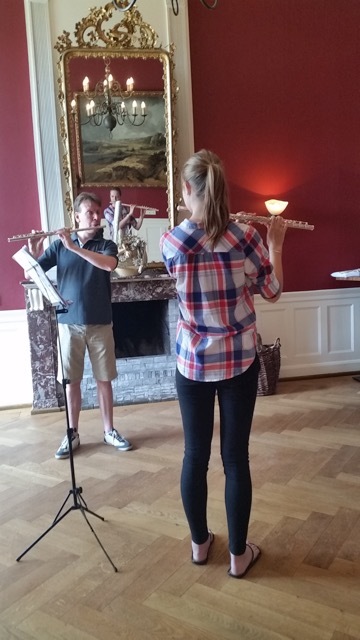 The NTK stayed outside and the YIP went back to the red room under the guide of Jeroen for a more specific flute warm-up. 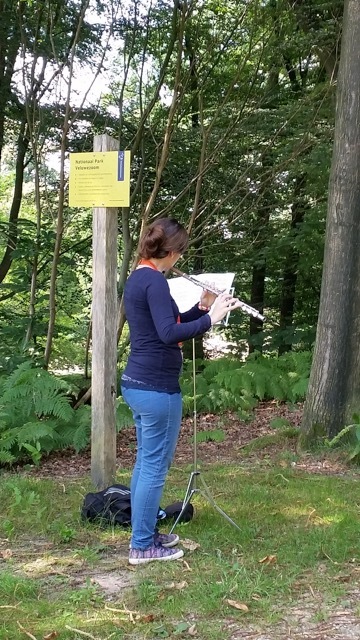 Then the morning continued with lessons and practice: We were surrounded by a lot of beautiful flute sounds - ànd mosquitos. Some of us had a workshop about Alexander Technique wich was very relaxing: at the end of the lesson we were aware of our bodies. After the lunch, wich was really good, the two groups split again. 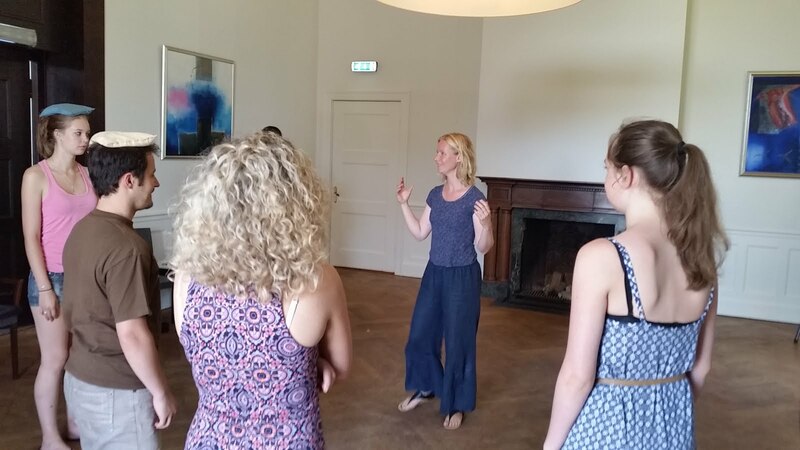 NTK had their masterclass with Emily and YIP participated at an incredibly usefull and interesting workshop about practice skills. They talked about mental practice, organisation of the time, stress during a performance and they learned a lot!!! After this workshop YIP had their masterclasses. 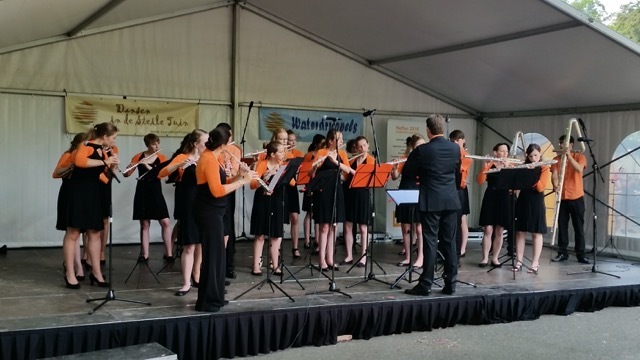 The NTK played in the flute orchestra while they were almost melting because of the heath. 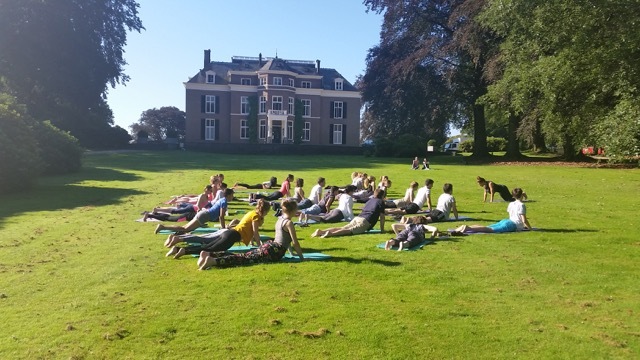 At 8:30am we gathered on the grass to do some yoga. It was the perfect start to the day and helped us all to wake up and get energised. After this, we all went to our designated warm up rooms where we got our flutes out and played through some exercises. 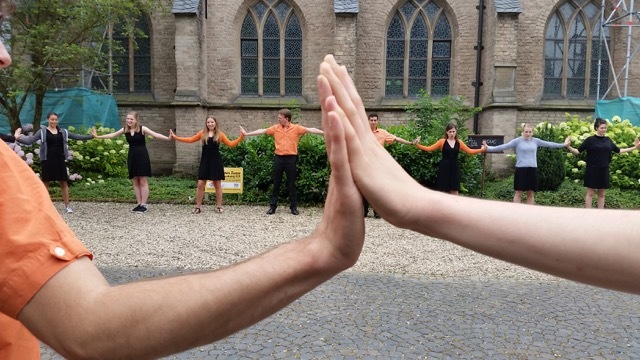 The NTK group warmed up by playing some scales and singing a Dutch song, which they had to sing in different keys. 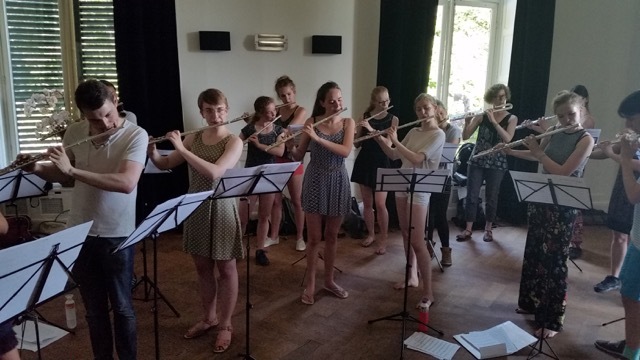 The YIP group also played some scales and discussed certain elements of flute playing which are important to think about when practising, which was really helpful. Throughout the rest of the morning, rehearsals for the afternoon's masterclasses took place, as well as individual flute lessons. 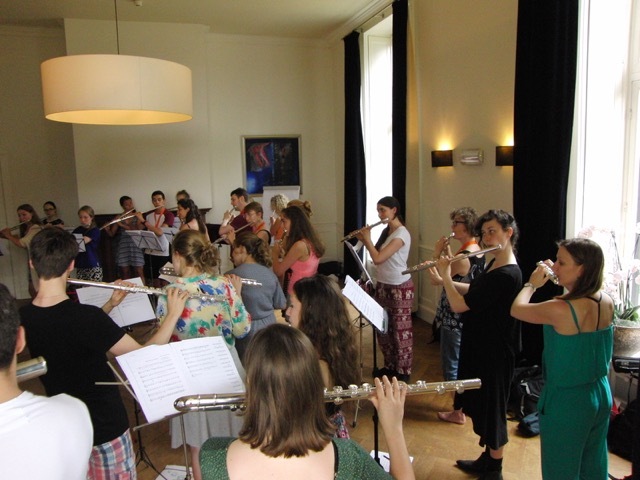 After a delicious lunch, the masterclasses began and then we all met up to play together for the first time as a flute orchestra. 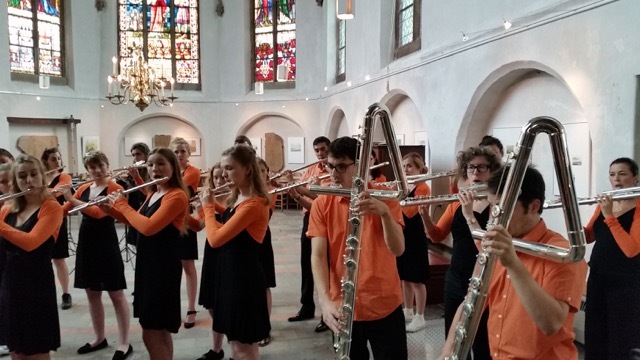 During this, we played through a piece for solo contrabass flute with flute choir, which was really fun to do, given that the contrabass flute is seldom used as a solo instrument. 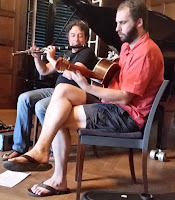 Once this had finished, we then had dinner, before attending an amazing workshop where we learned about Irish folk music from Isaac Muller and were treated to a fantastic performance of some Irish tunes with both Isaac and Wouter van der Schoor (on guitar) playing. Everybody had a really great time, so much so that there was an encore at the end. It's been another great day at Neflac! 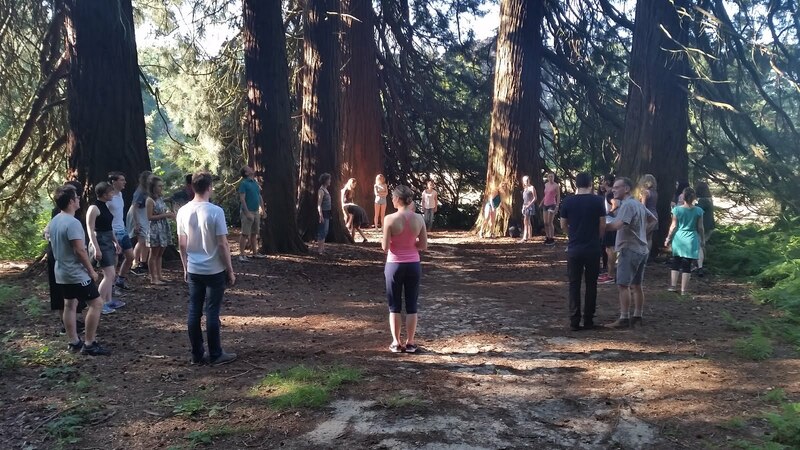 Today we started with a warming up in the forest. Today was Jannekke's birthday, so we sang for her. After that, we went inside for our lessons. 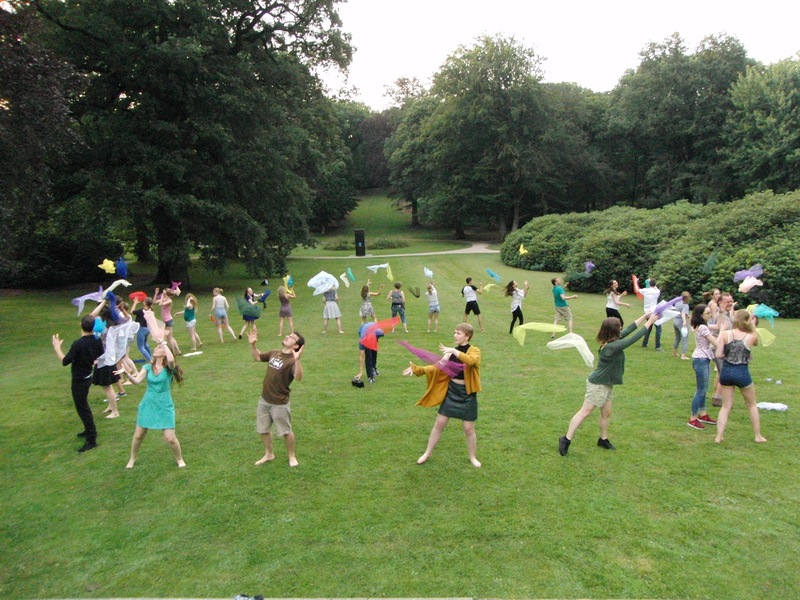 Some ensembles practised outside. Then we had lunch also in the fresh air. the NTK had after lunch the masterclasses from Emily. We could practise our ensembles and practise for ourselves. Later in the evening we had a breathing workshop from Perry. It was really helpfull and exciting. After the breathing exercises we finally had dinner. About 8 o'clock we had a workshop from Porgy. He pushed some of us really to their limits in a funny way. We laughed so much, we will never forget this evening. Thank you for this beautiful day!